Matthew Metzger’s contemporary interpretations of Chinese painting and its intentions allocate space and dimensionality through shifting and changing perspectives, which qualitatively empower the young painter’s “seeing” entirely. Metzger’s paintings, on view from March 15th – April 28th, 2018 at The Miller Gallery in Cincinnati deliberately question the point of view re: shifting perspectives. They refer to the nature of space and perspective in Chinese painting – Chinese painting invented one point perspective in the T’ang dynasty and rejected it in favor of vertical spatiality, achieved through gradient effects. As Charles Moffat states in his review of Chinese Landscape Painting, beginning in the Tang Dynasty, many paintings were landscapes, often shanshui (“mountain water”) paintings. 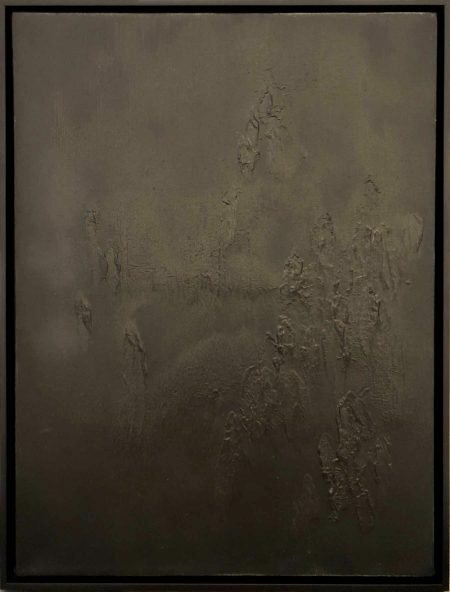 In these landscapes, monochromatic and sparse (a style that is collectively called shuimohua), the purpose was not to reproduce exactly the appearance of nature (realism) but rather to grasp an emotion or atmosphere so as to catch the “rhythm” of nature. “The Chinese paint essences, not likenesses” (Daniel Brown). Hence, Metzger’s paintings adopt this multi-perspectival practice via shifting gradient tones. By evoking modernist American minimalist traditions and exploring the atmospherics of Chinese painting, Metzger’s work embeds personal feelings and emotions into the image and its multifaceted perspectival practice. As a result, viewers can see a lot of white spaces, as Kwo Da-Wei states in Chinese Brushwork in Calligraphy and Painting “ (72). Hence, areas of the white canvas or silk – voids – are always to be found in Chinese painting and calligraphy and recur in Metzger’s paintings. They are not unfinished, empty, or yet-to-be-filled-up spaces. For, these voids are not actually empty. In fact, they are an integral part of a painting. As the observer is drawn into the physical landscape, Metzger’s multimodal perspectives – a product of his gradient experiments – engender a meditative relationship between energy, harmony, and the ceaseless renewal of the universe. 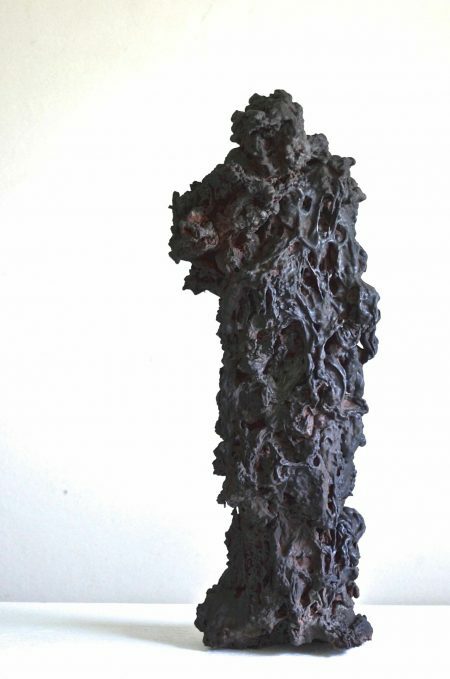 These Chinese influences are direct points of reference in Metzger’s work, while Western experimentation transpires via his material choices; isocyanate, polyol resin, and oil iron figural sculptures – stygian amorphous towers – are titled Adams (Cantos LXIV) (2018) and Jefferson (Cantos XXI) (2015). “The Cantos,” Ezra Pound’s 116 section incomplete poem, includes Chinese characters and thematic material – “Canto XLIX” is a poem of tranquil nature derived from a Chinese picture book that Pound’s parents brought with them when they retired to Rapallo, Italy. One of Pound’s final sections, “Canto XLV,” utilizes Chinese characters and references the “Analects of Confucius,” a collection of sayings and ideas attributed to the Chinese philosopher Confucius and his contemporaries. Metzger’s quotations of Pound and Confucius, herewith, are poetically aligned with newfound subjectivities – the amorphous sculptures, empowered by bodily and humanistic silhouettes. Metzger’s subject-referential sculptures differ from Modernist representational traditions, mediating Umberto Boccioni’s Futurist sculpture and his spatial studies with examinations of landscapes and material. 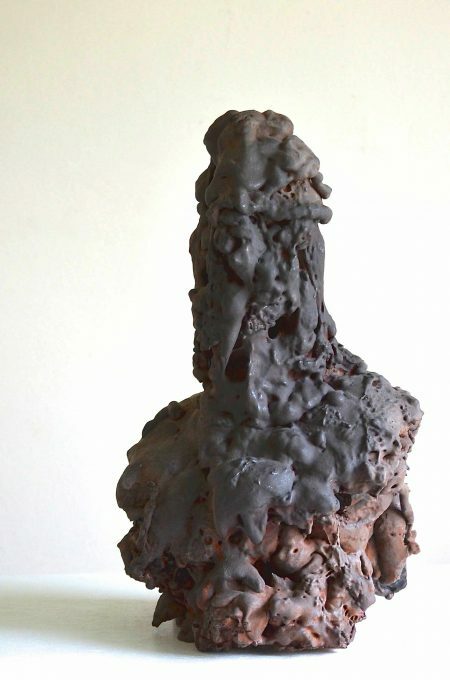 Metzger, whose work mediates illusion and materiality, uses unique materials to implore subjectivity in ambiguous figures, pairing proverbial psychologies within humanist gesture. Metzger’s Untitled walnut square fixture, which features a square cut of negative space, and his wood-acrylic Bench counter also conduct tactile case studies of materiality. Metzger’s furniture provide examples of experiential conduct, a thematic device Metzger also subtly implores in his essayistic paintings and sculptures. Architect Toru Mitani, in his essay “Moonlight in Zen Buddhist Temple Gardens: an Analytical Simulation,” culls upon the moon as a symbol of after-life and enlightenment. Mitani also references the ancient Zen garden design book “Notes on Garden Design,” describing a water feature with careful attention to “moonlight effect” (46). While Mitani subsequently utilizes rastor-modeling applications to research an analytic survey of Zen gardens, this “moonlight effect” is of literal aesthetic value when surveying Metzger’s gradients. His natural pigments, comprised of walnut oil, in Mountains in Fog XII (2018) and Cantos XVI (2018), assume the environmental calculation of Zen architecture and design principles, mirroring the transience and impermanence manifest in Metzger’s evaporating hues and blemishes. 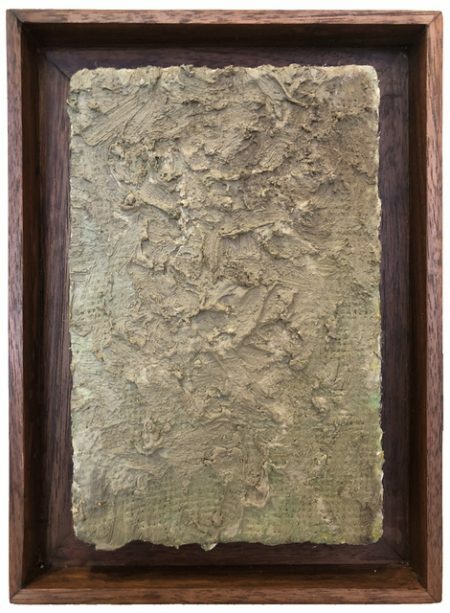 Thicket for Jim Harrison (2017), which is made of ochre, copper, and marble on jute serves as another literary reference – to the late nature essayist James “Jim” Harrison. Harrison’s poem “Spirit,” which appears in the collection “Dead Man’s Float,” identifies human spiritual life with nature, denoting that Harrison identifies with “art of the birdsong and sheep and the weathered Bridger Mountains that surround his house” (Kuipers). Harrison’s “Dead Man’s Float” explores anti-intellectual scenes, in which spiritual characters are placed within the context of the poet’s relationship with nature, which took root when he was growing up in Michigan. 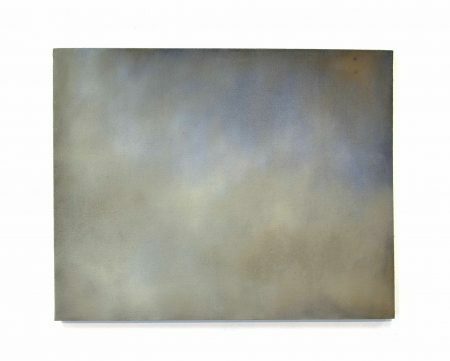 Such existential relationships transpire in Metzger’s work, a feature of the billowing landscapes and subtle gradient dissolve-effects that gyrate through darkness and light. Metzger, who once stated that his “…paintings have been an ongoing meditation” (Zabicki) certainly uses catharsis as an existential dogma, mediating the poles of figuration and abstraction. Metzger’s work has, for a long time, operated under conditions of trauma, as evinced in a past interview with the journal “Figure/Ground,” where Metzger references Paul Virilio’s book “The Accident of Art,” denoting that “all art comes from trauma…and that even surrealism for example is a type of coping with the War….I am very interested in this. Especially what generates the production of work in an artist’s studio and…that trauma is a common denominator.” Untranslatable experiences, perhaps evinced through natural phenomena, are de-intellectualized into ephemera, evinced by the array of untitled material-study works that Metzger provides. Metzger’s experiential work was well categorized by Jonathan Kamholtz as describing relationships to the “sublime.” It is perhaps the dynamical sublime, which is characterized by Kant – who distinguishes the dynamical sublime from the mathematical sublime (a product of magnitude) – who notes that “the irresistibility of [nature’s] power certainly makes us, considered as natural beings” (Kant 131). Metzger’s works reserve capacity for judgment with experiential necessity. Kant’s dynamical sublime is an intellectual process that both involves identification with nature and subjectivity, notions that Metzger underscores in his meditative work and quotation-technique. Much as Kant denoted the mix of pleasure and displeasure in the dynamical sublime, Metzger highlights identification with nascent and dissolving ephemera, undoing representational indexes and mediating antipodes. Judgments of beauty are transfixed by observational conditions, and Metzger’s practice contemplates subjective psychologies, empowering his work with practical philosophy and meditation. By utilizing shifting perspectives, audience members are presented with diverse referential points, evinced through Metzger’s adjusting points of reference. Truly experiential, these multifaceted perspectival nodes mirror modes of observation and seeing, where the observer’s vision is slighted. By mediating Western material-experimentation with Chinese painting thematics, Metzger’s work delicately balances and mends two opposed schools of visual art practice. Irving, A. “The Color of Pain.” Public Culture, vol. 21, no. 2, 2009, pp. 293–319., doi:10.1215/08992363-2008-030. Kamholtz, Jonathan. “Overwhelming Landscape: Jonathan Queen & Matthew Metzger at Miller Gallery, January 7-February 6, 2016 :: AEQAI.” AEQAI, AEQAI, Jan. 2016, aeqai.com/main/2016/01/overwhelming-landscape-jonathan-queen-matthew-metzger-at-miller-gallery-january-7-february-6-2016/. Kant, Immanuel, and Werner S. Pluhar. Critique of Judgment. Hackett, 2010. Kwo, Da-Wei. Chinese Brushwork in Calligraphy and Painting: Its History, Aesthetics, and Techniques. Dover, 1990. Kuipers, Dean. “Jim Harrison on Spirits, Bad Poetry and the Wonder of Nature.” Los Angeles Times, Los Angeles Times, 18 Dec. 2015, www.latimes.com/books/la-ca-jc-jim-harrison-20151220-story.html. Mitani, Toru. “Moonlight in Japanese Zen Buddhist Temple Gardens: an Analytical Simulation.” JoLA – Journal of Landscape Architecture, vol. 2011, no. 11, 2011, pp. 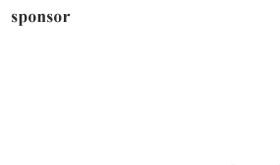 46–53., doi:10.3939/jola.2011.2011.11.46. Zabicki, Gwendolyn. “A Conversation with Matthew Metzger.” Figure/Ground, 21 Dec. 2015, figureground.org/a-conversation-with-matthew-metzger/.